Thompson Creek Molybdenum Mine is Idaho's largest mine at 3,000 acres and is a serious concern for Idahoans who care for Salmon River country. TCM started molybdenum production in 1983 with annual production of 12-18 million pounds. 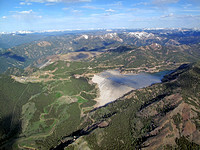 A 500-acre impoundment fills Bruno Creek canyon and contains over 100 million tons of processed mine waste, some containing pyrite. 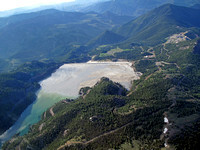 Eventually and depending on the mine’s life, the tailings facility will double in size to 200-million tons. 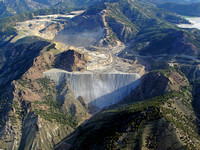 The impoundment is held back by a 600-foot sand embankment (the "sand dam"). Bruno Creek flows into Squaw Creek, then the Salmon River. 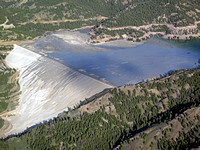 Events such as landslides, earthquakes, embankment erosion or water systems failures could expose pyrite to air and water, causing acid mine drainage to form, sending acid and dissolved metals downward toward the Salmon River. The Salmon River watershed is home to the most important remaining habitat for summer Chinook salmon in the entire Columbia River Basin. This river and its tributaries also support Snake River steelhead, bull trout and westslope cutthroat trout. In addition, the river provides outstanding opportunities for fishermen, campers, hikers and kayakers, and supports communities farther downstream. 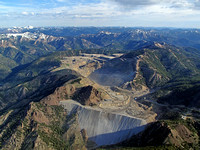 Citizens and conservation groups are working to ensure mining proposals are acceptable, and fighting proposals that are not in the best interest of Idaho.